Hugo Pérez Ovalles, Founder & CEO of Grupo Therrestra, leading construction company in the Dominican Republic and the Caribbean, appreciated all positive initiatives led by the Santo Domingo Cyberpark (*Parque Cibernético Santo Domingo) to boost and bolster the sector using cutting-edge technology. 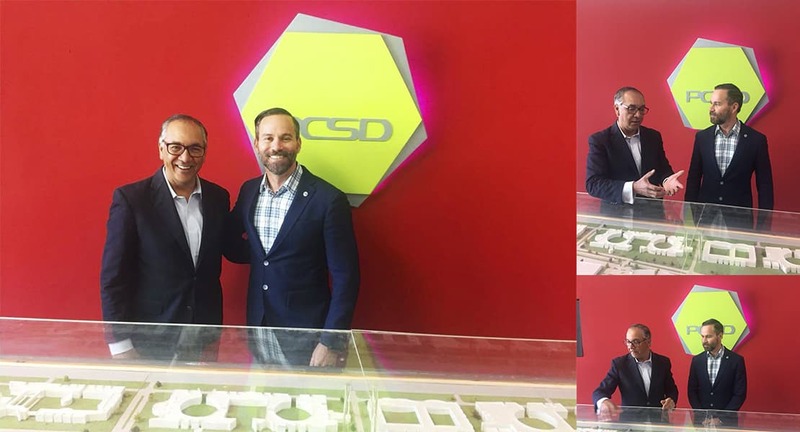 Pérez Ovalles visited the Cyberpark Hub alongside Eddy Martínez, chairman of the Board of Directors and the ITLA, where the latter explained all advances currently underway to integrate innovation and technology, to improve public-private joint venture projects. The Cyberpark, known as the “Silicon Valley of the Caribbean” features a business incubator program to promote technology start-ups known as “Emprende”, as well as several innovation labs -some of them tech-related- that require traditional industry businesses that include applied sciences in virtual and augmented reality.